Or at least: Breakfast of My Boys. I’ve always fed them oatmeal for breakfast in the interests of nutrition. Once Max outgrew baby oatmeal flakes, I used to buy those packets of instant oatmeal, since I only needed to make one bowl a day. (Neither Greg nor I prefer an oatmeal breakfast. Probably because we were so often forced to eat it in our childhoods. That’s right, baby! Keeping the tradition alive.) Now that my little Charlie-bear (sniffle) has decided that he’s too big for baby mush, it’s not as practical. Plus, that instant oatmeal is filled with sugar and other processed stuff, and I’m trying to get away from that. But since my oatmeal-making skills are pretty rusty (and, I’m still tired of it, Mom. That and spaghetti.) I’ve been looking for oatmeal-y breakfasts to make that let me mix things up a bit. First up: breakfast cookies. The Last Cookie – caught on film. Shown pretty much actual size. Maybe a little smaller than actual size. These are super fast, super easy to make, and really good. Really nutritious, too, not like some ‘breakfast cookie’ recipes I’ve seen. It multiplies well, and stores well (I once stuck one of these in a ziplock for 4 days, and it was still soft, chewy, and good when I pulled it out), and the boys love them. Once they’ve eaten theirs, they fight over who gets to mooch off of mine. Max thinks they’re real cookies. Haha. One of these days I need to just multiply the recipe by ten, bake ’em all up, stick them away, and not have to worry about breakfast or snacks for like a week. Second (and last, dang, this is a long post): Creamy Blueberry Oatmeal. 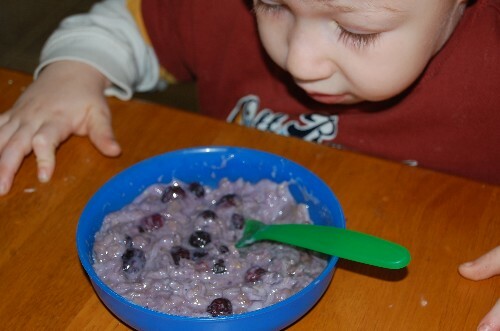 Max loves it and calls it ‘purple oatmeal,’ Charlie thinks it’s disgusting. Maybe he’s not quite ready for grown-up oatmeal, after all. Or he just hates purple. I don’t know. In small saucepan, scald milk over medium/medium-high heat, stirring frequently. Once it has scalded, turn the heat up and (watching closely and stirring often) bring to a boil. 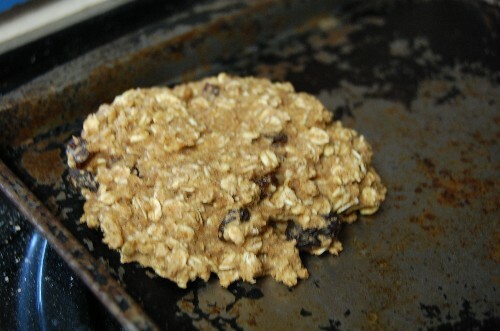 Once it begins to boil, immediately add oats and turn down heat. Cook, stirring, for 5 minutes. Add blueberries, cook for several minutes more until it looks done. Add sugar to taste. Makes three small or two ‘normal’ bowls of oatmeal. Maybe I’m strange, but I really love being able to give my kids food with such a short ingredient list. Milk, blueberries, oats, sugar? Sounds like breakfast to me. Good times. We had a BBQ this weekend. Oatmeal. I love oatmeal. (and I was force-fed it as a child too. Funny that I love it so much now) We eat it almost every morning here as well. That or Cream of Wheat or Oat Bran. (which is very much like cream of wheat…its sort of like the difference between white bread and wheat bread) I will have to try your recipes. They look very yummy. I learned a trick from my MIL. If you cook it in milk rather than water, it turns out a lot creamier, even when you add milk later. I also add WAY too much sugar/brown sugar!! I like to add cinnamon as well. Your mom is a woman after my own heart–check out that cheapy advice going on! Chunky and I have been eating oatmeal a lot lately too. One cup oat meal, two cups water, cut up two small apples into it, nuke for 6 mins, spoon some brown sugar on top and ta-da. I might have to steal that cookie recipe! MMMMMMM oatmeal! I love the stuff….just not the processed instant kind. I’m an old-fashioned oatmeal kind of girl. Thanks for the recipe, I shall have to make it! Hey all you oat meal lovers – I just got a grain grinder – very cool. Grinds fast = super fast. And there is nothing like oatmeal cookies made with oatflour!! !